Exciting news for the world’s arachnophiles (spider lovers) broke late last year – a spider was discovered in the Peruvian Amazon that constructs a much larger fake spider in the center of its web. The as-yet-unnamed arachnid, likely belonging to the genus Cyclosa, creates its faux-spider masterpieces (some of which have eight legs!) out of leafy debris and dead insect parts. 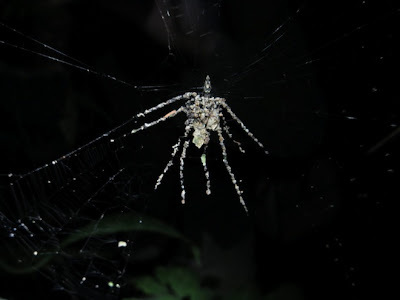 To further enhance the big-spider illusion, the real spider hides at the head of its creation and plucks strands of the web to make it vibrate. So, does this spider make art? Nope, sorry – it’s not art. Creating a larger decoy of itself to frighten off potential predators is a form of self-protective mimicry that’s hardwired into the spider’s genes. 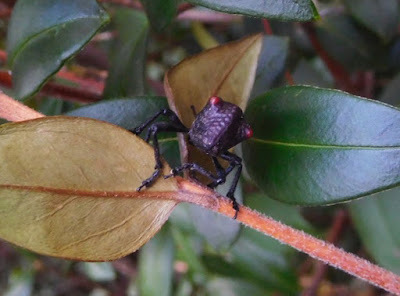 The most common form of mimicry is camouflage. Such visual mimicry can be as basic as a lion’s tawny coat blending in with the African savannah, or a gray-patterned moth disappearing when it lands on a similarly colored tree. More complex examples include caterpillars that pose as twigs, or leafy seadragons that are almost indistinguishable from seaweed, or spiders that, along with their webs, can be mistaken for bird droppings in both color and shape. 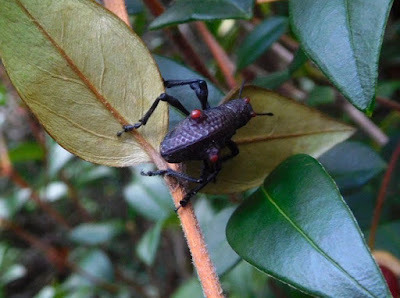 In Batesian mimicry, harmless species evolve to visually impersonate poisonous or distasteful species, which makes it much less likely that they, themselves, will be eaten. A master of this particular adaptation is the Indonesian mimic octopus. The mimic octopus impersonates a flatfish, a scorpionfish, and a sea snake. Octopuses are masters of disguise and can change color and pattern, and even texture, to match their surroundings. The mimic octopus’s self-defense strategy goes one step further – it’s a shape-shifter. This diminutive cephalopod has evolved an elaborate collection of behaviors that allow it to ape other marine animals. It stretches out its arms to imitate a scorpionfish flaring its poisonous spines, or hunkers down with only two legs extended in either direction to impersonate a venomous sea snake, or swims flattened out to mimic the shape of a flatfish. To date, this little octopus has been observed posing as fifteen other marine creatures! A fun twist to this amazing story is that scientists have recently witnessed a timid little black-marble jawfish, whose markings are strikingly similar to those of the mimic octopus, swimming perfectly disguised among the arms of one of these octopuses. A mimic mimics a mimic! Decoy mimicry is yet another variation, in which animals have developed a means to either divert the attention of a predator or, conversely, to attract the attention of a potential meal. One of the most radical practitioners of decoy mimicry is the gecko who, when threatened, is capable of discarding its own tail. The cast-off tails of some geckos flop around and writhe, offering a tantalizing alternative meal to predators while the geckos themselves escape. In Australia, the writhing, discarded tail of the chameleon gecko is made even more irresistible – it actually squeaks! 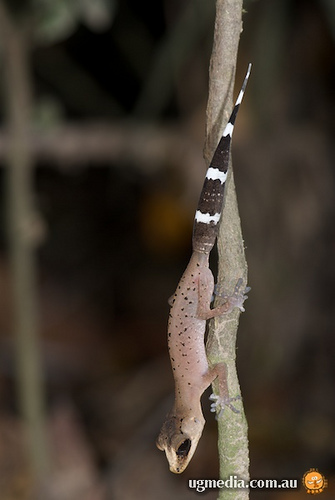 Though self-amputation may sound like an extreme adaptation for survival, geckos are capable of growing replacement tails within a few months. The adaptation of decoy mimicry isn’t confined to land animals. 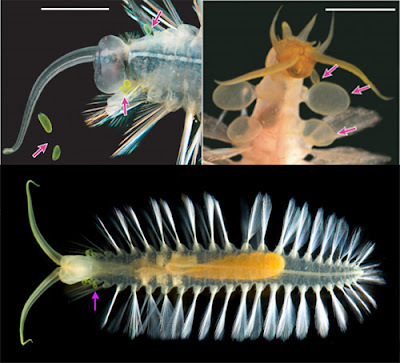 While studying life in the ocean’s depths aided by remote-controlled submarines, a group of scientists led by research zoologist Karen Osborn discovered seven new marine worms (annelids), some of which have developed a novel form of decoy mimicry – we just don’t know exactly what they’re mimicking. These small bristly worms, the biggest no longer than a finger, come equipped with tiny balloons attached to their bodies near their heads. When one of these worms, which have been dubbed “green bombers,” is touched, it releases one or more of these bioluminescent “bombs” that give off intense green light for several seconds. It’s likely that a would-be predator, searching for a tasty morsel in the darkness, would be distracted by these mini floating lights while the worm is able to avoid being eaten by quickly swimming backwards out of harm’s way. I have to add this guy I came across in Chile. It's a fabulous example of automimicry – the kind where part of an animal's body looks like a more vulnerable part. 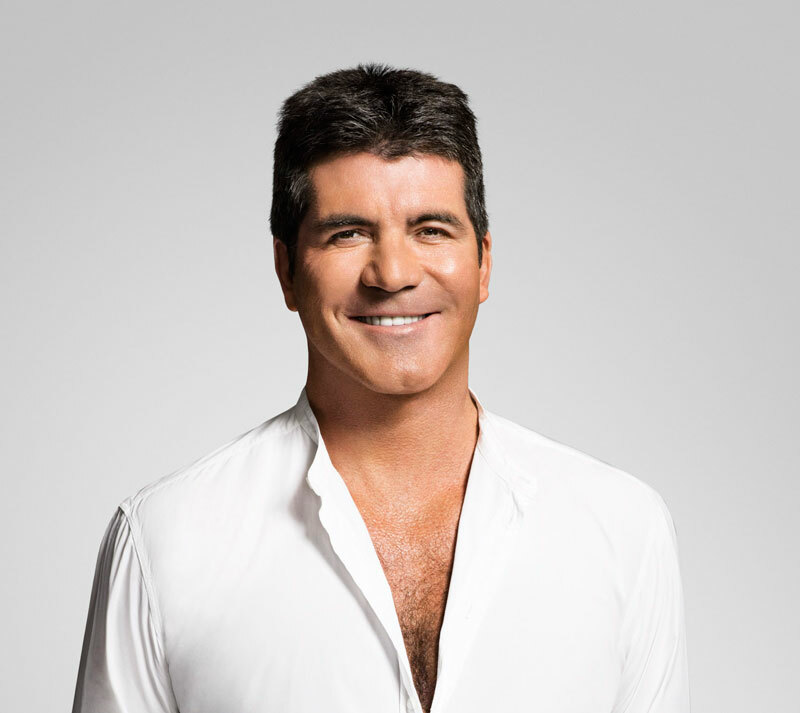 · The person with talent chose the wrong song/genre/medium, etc. · The person with talent has the personality of a wet noodle. 2 There are many differences in opinion; don’t trust what any one person says, but if lots of people say the same thing, they are more likely to be right. 3 Just because you think you have talent doesn’t mean you actually do. We can delude ourselves. 4 Just because you don’t think you have much talent, doesn’t mean you don’t. We can underestimate ourselves. 6 Young people are capable of a great deal, not just in terms of raw talent, but drive, dedication and maturity. 7 Humans like surprises, in art as well as in people. 8 Everyone likes a good rags to riches story, but especially the rags part. 9 People considered strange in everyday life are often fascinating and attractive if put on a stage. Big personalities need distance to be most appreciated. NOTE: there is such a thing as being too weird (see below). 10. Talent in restraint with the occasional burst of brilliance is ideal. A wild streak is great, as long as it is just a streak and not a full immersion. 11. Humility is appealing. So is authenticity. 12. Hard work and determination are essential, but not enough on their own. 13. There is a big difference between good and great. I live in Regina, Saskatchewan. We joke that weather is more than small-talk here. Too often, it's what everyone is talking about. 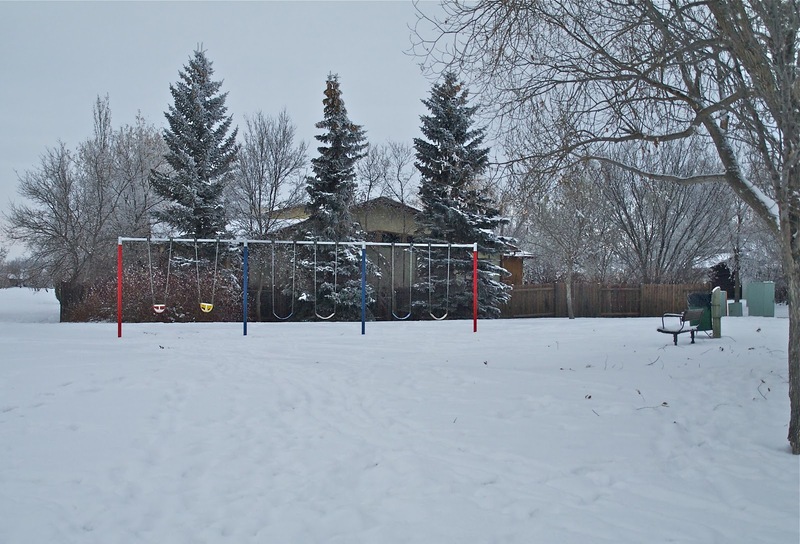 In December, the snow continued. 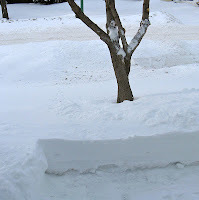 And with another 20+ cm dump yesterday, January just seems like more of the same. As you can probably tell, I'm not a fan of snow. But if you can't get away from it, you might as well dig into it. So I'm digging out a copy of Snowflake Bentley by Jacqueline Briggs Martin, searching on the Internet, and turning to science to help me beat the winter blahs. 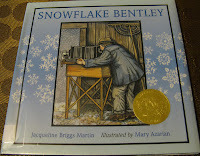 Snowflake Bentley tells the story of Vermont farmer Wilson Bentley, who studied snow and took pictures of snow crystals. 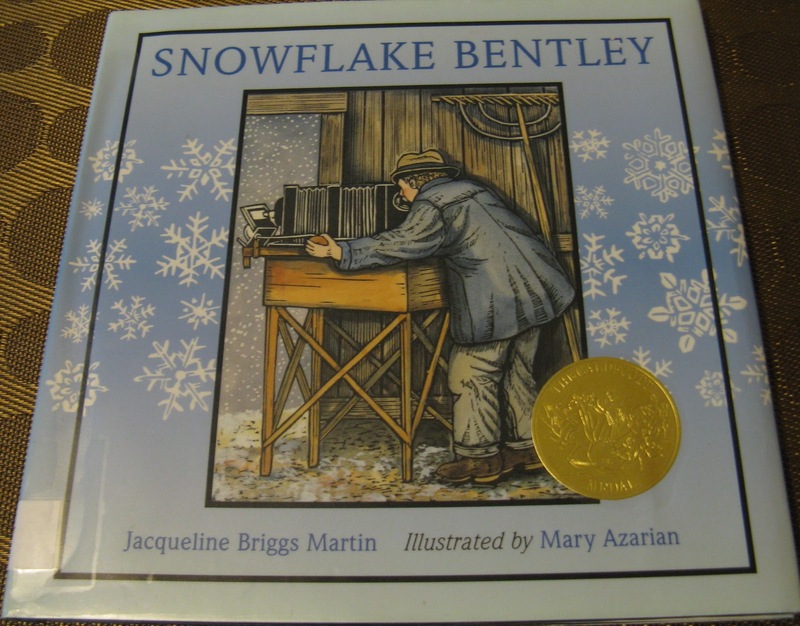 In the book, someone tells Bentley that "snow in Vermont is as common as dust." I laughed when I read those lines. Did you know that snowflakes start out as tiny crystals no larger than a speck of dirt or dust, and join with other crystals when they fall? Most snowflakes are six-sided, and the size of one flake depends on the number of crystals forming it. When I was a child, I remember catching snowflakes on a mitten. An individual snowflake can be quite beautiful. That's hard to believe when you look at the pile of snow in my front yard these days. 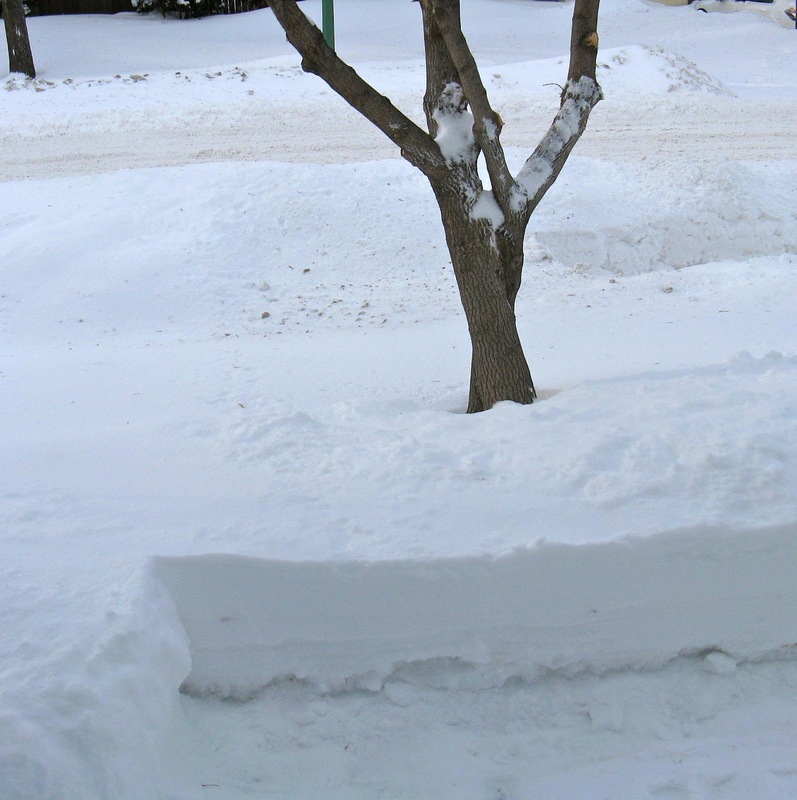 Thank goodness for neighbours with snowploughs! Lately I haven't been looking at the individual snowflakes, like Bentley did, because there's just been too much of it. Some of it is packed hard; some is powdery; some has already melted and frozen often enough to form ice underneath. The National Snow and Ice Data Centre (NSIDC) has collected a whole database of types of snow. The NSIDC site talks about blizzards, flurries, and snowbursts like the ones we've experienced this winter. 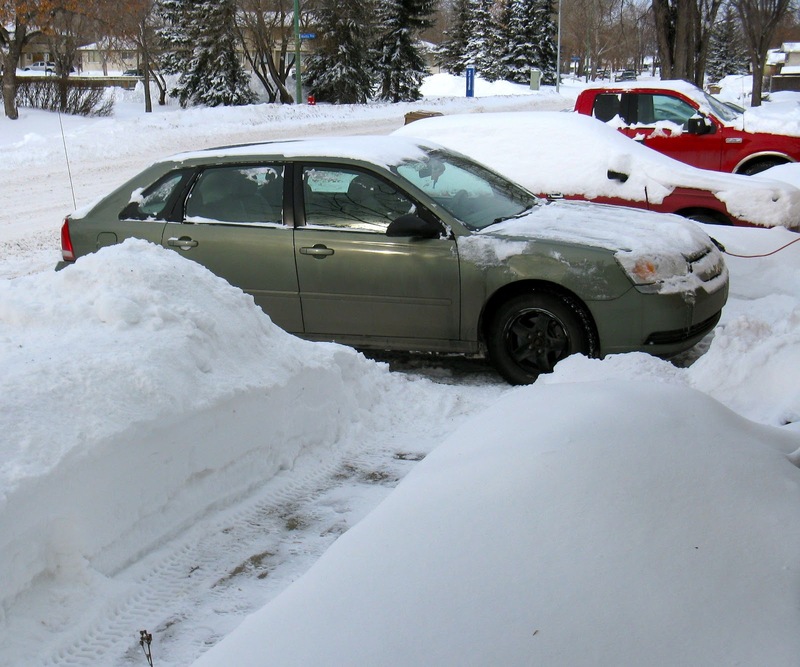 We're too familiar with blowing snow and drifting snow. That's all we seem to see on the roads lately. The site lists some unusual types too, like "névé" (refrozen and compacted) and "graupel" (rounded snowflakes or snow pellets). 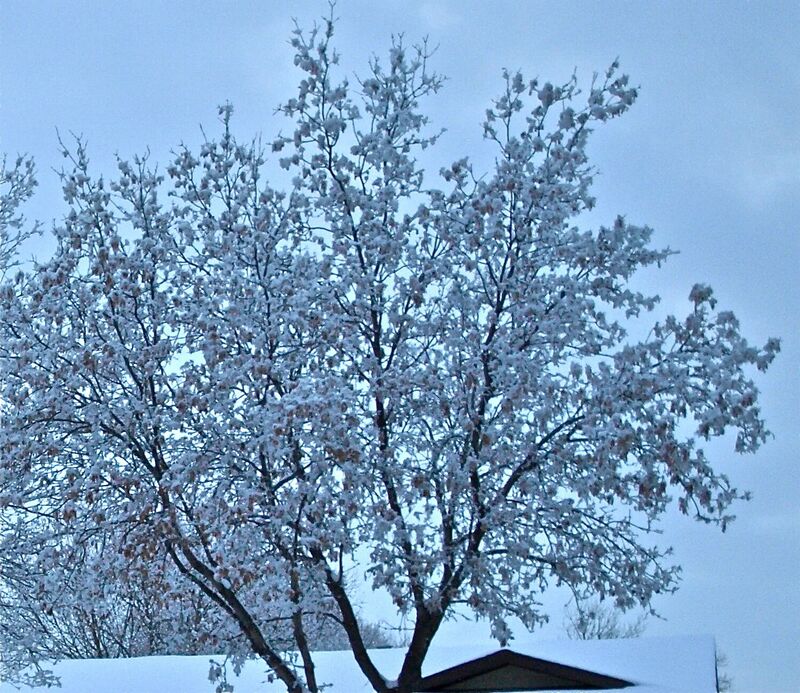 My favorite is hoarfrost. 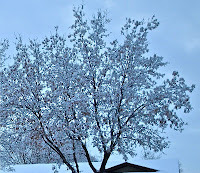 We've certainly had what feels like record amounts of hoarfrost on the trees this winter, but I haven't taken the time to enjoy the beauty of it. I think I'll go out and take some more pictures, as soon as it warms up. 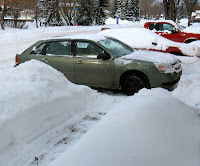 Please leave a comment and share interesting facts about snow or snow science with us. I was born and raised in The Netherlands. Not Holland. ‘Holland’ refers only to two of the twelve provinces. The Netherlands is a small country in Europe. It is a little over 41 thousand square kilometers (or 16 thousand miles). That means that you can get almost 17 times its size out of the state of Texas! A few hundred years ago the country was even smaller. It lies at the western edge of Europe, where big rivers flow into the sea. Much of the country is very low land and has often flooded. In fact, most of the country is under sea level and the lowest point in The Netherlands is an amazing 7 meters (20 feet) below sea level! Even its name tells you a lot: ‘Nether’ means ‘low’: low lands. Some 700 years ago people decided to use windmills to help drain the land. Not only did they use windmills to pump water away from flooded lands, they also started using them to reclaim land. They built dikes around a low lying area and then used the windmills to pump the water to the other side of the dike, into a river. Only twenty years ago, the country added a whole new province to its size by reclaiming land from the sea. 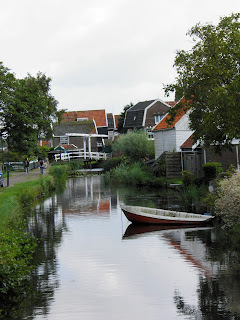 There used to be a large bay, the Zuiderzee. People built a huge dike to dam it off from the sea, and then started pumping water out of the bay until the land laid dry. The new province, called Flevoland, added 1,400 square kilometers to the little country! Many windmills are still standing throughout the country. Some are used for pumping water while others use the power of the wind to grind grain and other crops. There are many different types of mills. Sometimes the miller even lives inside the windmill. Can you image living in a house that is round or octagonal, that shakes and creaks in the wind? One spot in The Netherlands is especially famous for its beautifully preserved windmills. On a sunny day you can sometimes see 19 windmills happily turning their huge arms in the breeze. Not only do they still pump water away from the low-lying polder land, they also attract thousands of visitors who come to see the spectacular sight! Nowadays, new wind mills generate power by harnessing the wind. The new type of windmill is altering the landscape but helping to generate power from a renewable resource. The amount of power generated by a new windmill depends on the strength of the wind and the number of days of wind per year. The average Dutch household uses 3.400 kWh per year. A smal 'wind park' (several windmill turbines together) produces 21.900 MWh, enough electricy for some 6,000 households! 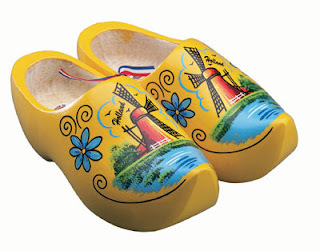 BTW: Wooden shoes have been used in The Netherlands for hundreds of years. You can best compare them to rubber boots: they are handy to use when it is muddy in your yard, they keep your feet dry and they come off much easier than boots! It is not true that everyone in The Netherlands wears wooden shoes: just some farmers or gardeners choose to use them. But they have become a tourism symbol for the small country! Margriet Ruurs is the author of 27 books for children. Her book Children Around the World will be published by Kids Can Press in 2014.